burndive: hacking my mind: Land ho! Ever since my dad came to visit me in April, I've been considering buying some land and building a house on it. Not with my own two hands, mind you: they have contractors and building companies for that sort of thing. Oh, sure, I can do a little plumbing, and cut wood and swing a hammer with the best of them, but that would take a lot of time and effort, and who wants that? I'd rather have God do it all for me, isn't that what that verse means? Seriously, though, I might get involved in some of the construction or finish work to save a few bucks here and there, but I'm not going to count on being able to do it all, especially on this first one. See, the plan is to sell the house after a couple of years, tax free, and put the money into another house: lather, rinse, repeat. 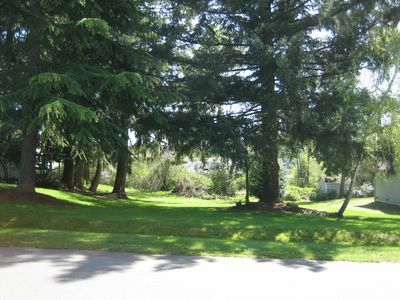 The picture below is of a piece of property that I am seriously considering making an offer on within the next few days. Please pray that I will have wisdom and diligence in making the offer (or not), in investigating the land for potential problems, in selecting a builder and house plans, and in talking to lenders. I've asked the Lord to make it plain to me whether he wants me to build here: that he would give me peace about it. And he will. Lately I've been noticing in my life and in Scripture, just how in-control of everything God really is. Tonight in our mid-week Bible study we were in Mark 13, and right in the middle of telling his disciples about all the things that are going to happen during the tribulation, Jesus says "But take heed, behold I have told you everything in advance." (Mark 13:23) It's as if he were saying, don't worry when you see the world in chaos and its powers being turned upside-down and backwards, because I am your protector and I am in total control: in fact, this is my plan, the plan I have had since before the beginning of time. I'm doing it on purpose, and nothing surprises me. your not going to cut down those trees, are you?